Twilight of the Idols revisits some of the sensational scandals of early Hollywood to evaluate their importance for our contemporary understanding of human deviance. By analyzing changes in the star system and by exploring the careers of individual stars—Wallace Reid, Rudolph Valentino, and Mabel Normand among them—Mark Lynn Anderson shows how the era’s celebrity culture shaped public ideas about personality and human conduct and played a pivotal role in the emergent human sciences of psychology, anthropology, and sociology. Anderson looks at motion picture stars who embodied various forms of deviance—narcotic addiction, criminality, sexual perversion, and racial indeterminacy. He considers how the studios profited from popularizing ideas about deviance, and how the debates generated by the early Hollywood scandals continue to affect our notions of personality, sexuality, and public morals. Mark Lynn Anderson is Associate Professor of Film Studies in the Department of English at the University of Pittsburgh. 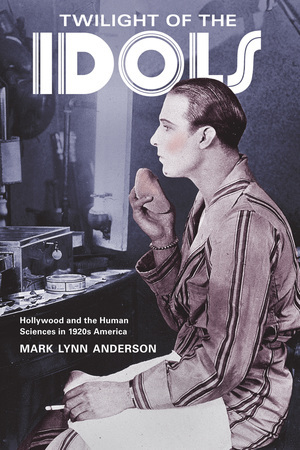 "Twilight of the Idols is an outstanding study of Hollywood celebrity culture in the wake of the star scandals that rocked the industry in 1921 and 1922. Through case studies of key male figures of the era, including Wallace Reid, Leopold and Loeb, and Rudolph Valentino, Mark Lynn Anderson argues that deviance became a central trope through which both famous personalities and their adoring fans were conceived in the evolving discourses of psychoanalysis, sociology, and anthropology. Anderson offers a compelling reading of the origins of the star system in the best discussion yet of the interrelationships between male deviance, queerness, and modern stardom. Clearly and engagingly written, and impeccably researched, Twilight of the Idols is poised to make a major contribution to film studies, queer studies, and American studies." "Mark Lynn Anderson has written a remarkable book. With its focus on male deviance and the human sciences in twenties American culture, Twilight of the Idols: Hollywood and the Human Sciences in 1920s America represents new directions for scholarship on film stardom and film history in this period. Through careful analysis of changes in the star system and detailed exploration of the careers of exemplary individual stars, such as Wallace Reid, Rudolph Valentino, and Mabel Normand, this book helps us to better understand the contours of the modern personality promoted by the cinema and the widespread interest in deviant behavior in the 1920s—both of which remain very much with us today."